Boardgamegeek (well, really, rgpgeek) is running a Fiasco playset design contest. So, that sounds like fun. Here's a link to my entry. The concept of the theme came from a thread on story-games.com, which is a forum dedicated to narrative RGPs, and is pretty interesting to read. They use a lot of big words over there, and a lot of big-named concepts, and ideas are generally well shared. Unlike board game design, where it seems a lot of it is "I've this this great idea, but I'm not telling you because you'll steal my secrets." Anyway, the theme is centered around Rankin Bass holiday specials. Unlike most fiascos, which have a sort of gritty, losers-trying-to-better-themselves-in-a-really-bad-way kind of thing, Holly Jolly! is a bit more fanciful, with nods to magical devices, and talking animals. Or in the case of the cover artwork as shown to the left here, animated talking and singing snowmen. 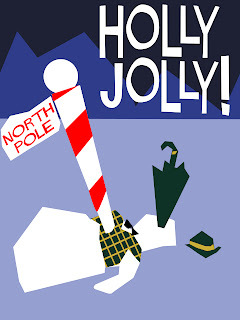 Well, animated before being stabbed by the North Pole marker in the chest and his umbrella through the eye. Of course, there's a still a pretty good chance that Santa Claus is going to wind up being tossed into the blades of a large snow thrower, like all good fiasco's should end.